Both DMS Holland and Elling Yachts’ support of and commitment to embracing innovation is clearly evident in the results of their recent cooperation which was made official last month. It is the Elling E4 which will be the very first boat to be equipped with DMS Holland’s latest innovative stabilisation system. Following the successful development and subsequent launch to market of the electric roll damping system for yachts up to 30 metres, the MagnusMaster, DMS Holland, in January of this year, started with the development of a roll damping system for fast-planing yachts up to 30 metres. This new AntiRoll damping system, like the MagnusMaster, will be produced as a standard-series stabiliser. 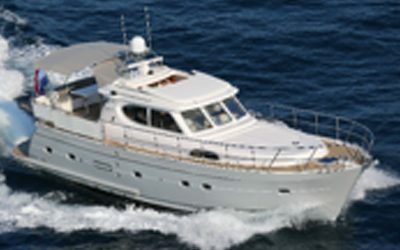 Until now, the AntiRoll has only be a supplied as a ‘custom build’ system for super- and mega yachts. This superyacht dual-axis stabiliser, patented by DMS Holland, forms the basis for the new system. The technology behind AntiRoll remains the same, namely high-aspect fins that rotate whilst sailing and flap when the yacht is at anchor. It is stabilisation at fast speed that will form the extra addition and make it a 3-in-1 stabiliser. 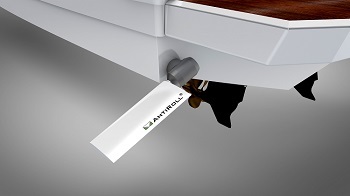 This new all-in-one stabiliser can easily be mounted on the transom. “Smaller superyacht builders often proceed faster with their innovations than many of the world’s super- or mega yacht builders. The connection to a small superyacht builder such as Elling Yachts from just around the corner was quickly found through our home port in Den Bosch”, explains Patrick Noor. In the area, Elling Yachts, based in Aalst, is mainly known under the name Neptunus which was founded over 35 years ago in Hardinxveld-Giessendam. Not so long ago, their Elling E4, a category A boat, was endorsed as suitable for the worst sailing conditions such as those found on the Atlantic Ocean. In spectacular fashion to demonstrate that the vessel was self-righting and that it could nicely and steadily regain its in-water sailing position, this Elling E4 was capsized. This almost 15 metre, ocean-worthy Elling E4 will be the first vessel in the world to be equipped with DMS Holland’s exceptionally innovative and patented stabilisation system, the AntiRoll all-in-one stabiliser. “When I read the press release from DMS Holland, I was immediately convinced that this system would be the ideal system for the now more than 200 Elling E4 customers. We regularly receive requests, in both the new build phase and for retro-fit, to equip a vessel with stabilisers. That is certainly not an easy task given the limited remaining space in the E4. Many of our customers sail on the sea and unfortunately that always comes with an element of rolling for all vessels. Not even our Elling E4 can escape that”, laughs Anton van den Bosch, founder of Elling Yachts. “Anton was always very clear. He absolutely did not want anything fitted underneath his beautiful vessel. Be it fins or rotors, both would generate more resistance and that would always be extremely unfavourable for the speed of their boats. The fact that we, in addition to stabilisation both whilst sailing and at anchor, can also provide a positive contribution towards the speed with this new AntiRoll all-in-one stabiliser, is of course great. However, what we are even more proud of is that Elling Yachts is willing to support this wonderful innovation by really wanting to be the very first to use it. That is why we are convinced that this collaboration will grow both of us even further on the map worldwide. This will be even clearer to see at METS in November”, says Patrick Noor. During the upcoming Hiswa-in-Water show both companies will be present and available to provide more information (stand number G-13 and KO-56).